Plaster.com sells casting and mold-making plasters of varying strengths and applications. They also have some helpful and detailed documents on how best to prepare plaster. This is a “must” of you are interested in tessellation. A lot of materials and resources here. A lot of interesting images, tutorials and diagrams by Ben Parker. Check it out. Unfortunately this book is not yet available. It will come out May 30. Tessellations—shapes repeated over and over to fill a plane without overlapping—have inspired beautiful art, from intricate tile work to M.C. Escher’s playful graphics. Now, master origami artist Eric Gjerde has produced the same stunning kaleidoscopic patterns simply by folding paper! His awe-inspiring collection—the first of its kind—explores the creative possibilities of origami tessellations. The techniques will captivate anyone interested in papercrafting, mathematics, architecture, and design. Gjerde meticulously walks you through all the key folds and creases. Twenty-five projects are organized by complexity, beginning with the easy-to-learn Tiles Hexagon Tessellation and continuing to more exotic designs, like Arms of Shiva, Field of Stars, and Aztec Twist. 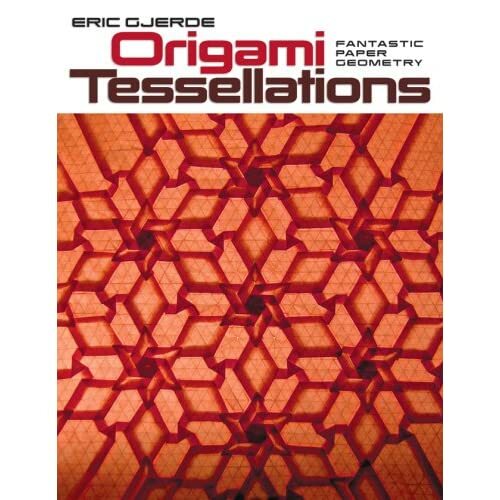 Each one appears in extremely close-up photos (sometimes backlit) and an inspiring gallery of breathtaking tessellations by origami artists concludes the book. Simply open this file in processing, or copy and paste its contents into a new project. Move the mouse left and right increase or decrease the number of tiles. Dr. Lang is one of the pioneers of the cross-disciplinary marriage of origami with mathematics. His work is impressive but, again, too figurative for our purpose. Nevertheless, he developed a series of software applications that simulate origami folding and aid origami pattern making on the computer. Those programs are downloadable from his website. Have fun experimenting with it.